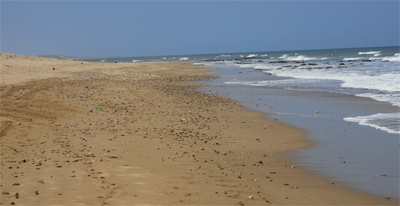 Cap Sim and Sidi Kaouki (Kawki) can be reached by walking along the beach from Essaouira, passing the river Oued Ksob and southwards. It´s about 20 km easy walk on sandy beaches. The Lighthouse is situated on a hill top and there is a track from the beach and from the village nearby. 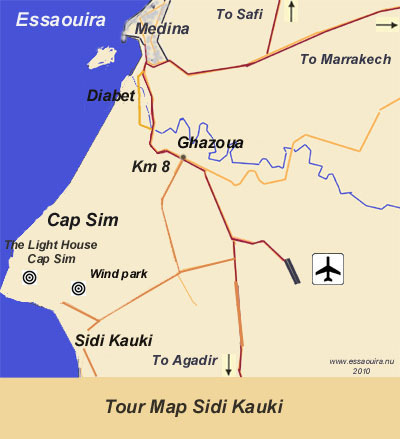 By bicycle from Essaouira it is about 20 km to Sidi Kaouki Beach and there is a road from Km 8 passing Ghazoua village. 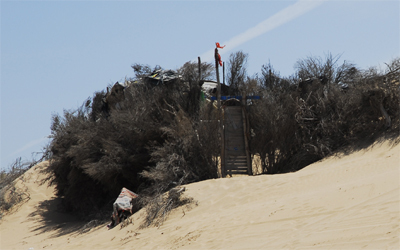 Regular tours with LIMA BUS to Sidi Kaouki from Bab Doukkala Essaouira. 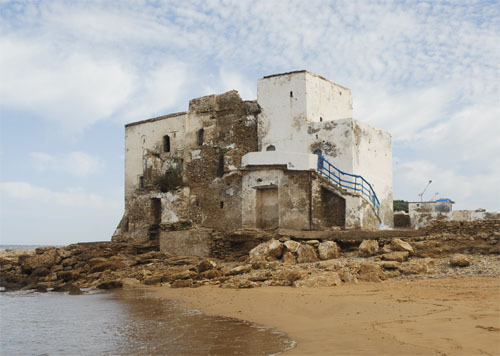 The village Sidi Kaouki was named after a 19th Century marabout and the shrine dedicated to him by the sea still attracts pilgrims to this day. 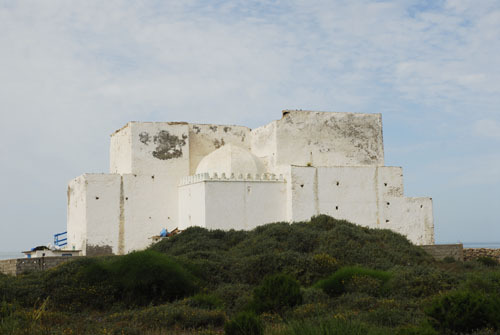 For Ida Ou Madda, Sidi Kawki is a place of pilgrimage where it organizes Maârouf for the first haircut of the new - born. By this rite of passage, it puts the child, so to speak, under the protection of the sea marabout. This pilgrimage is marked by a sacrifice, a communal meal and a dance collective ahouach. The tomb of the saint is constructed on the ruins of an old fortress. South side. and Sidi Mogdoul are the most important marabouts and they are protectors of the sailors. Arabic marabath (related to god) , be firm and devout. In terms of Islam it means a man who devoted himself to the practice and teaching of religious life. Today, these pious men are revered as saints in their lifetime as extension means a marabout's tomb or mausoleum of a Muslim saint. In the Essaouira region you can see many of thoose. The most famous is Sidi Magdoul in Essaouira. In colonial times, the French gave to these constructs the improper name of marabout but should be named koubba. Koubba or Koubbèh (from Arabic koubba = dome, cupola). - Monument erected on the grave of a revered figure, or in a place where he stayed. The koubba, which occur mainly in North Africa, consisting of a cubic part surmounted by a spherical dome or arched, sometimes decorated with a crescent, and their size rarely exceeds 4 meters square, and some of them present in their interior a little room where you can find shelter. North side. The koubba of Sidi Kaouki. 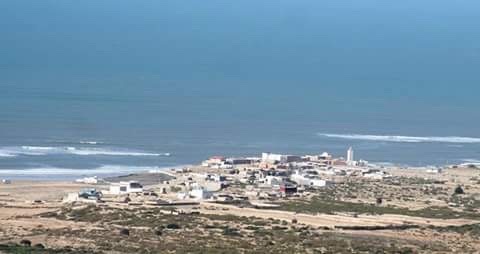 Sidi Kaouki has a golden beach and is very popular by surfers because it has both beach and reef breaks and the famous Cap Sim point break, which is known as one of the best waves in Morocco. with Marabout Sidi M’barek. Erosion of rocks by the river Aghbalou. 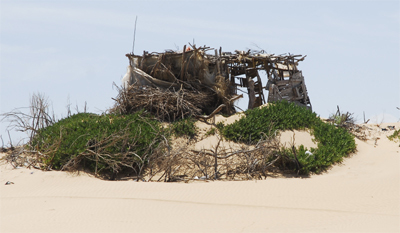 A fishermans cabin built of trees and branches and collects from the sea.